It appeared that Trudeau’s statements at a news conference prompted Trump's reversal. The president's allegation of mendacity by Trudeau stood out from the norm of diplomatic politeness. 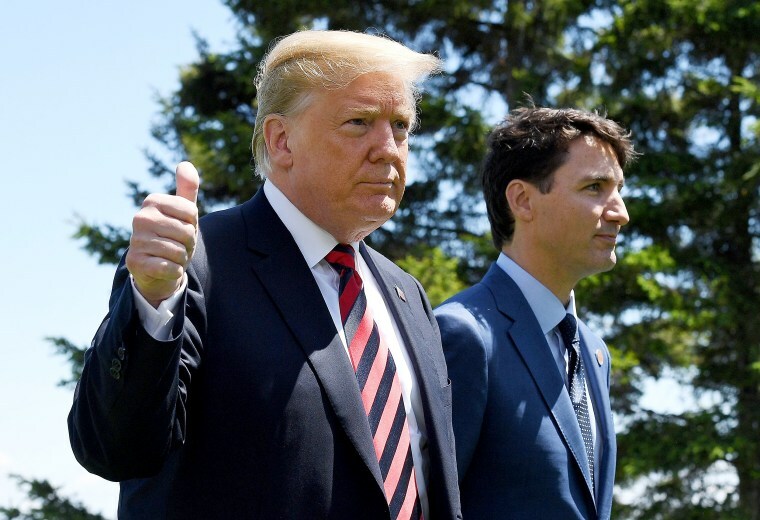 White House National Economic Council Director Larry Kudlow confirmed on CBS's "Face the Nation" that Trudeau's statements caused Trump to pull out of the meeting, claiming the Canadian prime minister had "betrayed Trump and the G7." "There's a special place in hell for any foreign leader that engages in bad faith diplomacy with President Donald J. Trump and then tries to stab him in the back on the way out the door and that's what bad faith Justin Trudeau did with that stun press conference," Navarro said, calling the communiqué "socialist." His National Security Advisor, John Bolton, reiterated Trump's vow not to let other nations use the U.S. as a "piggy bank." After Trump departed Canada, Trudeau pledged that Canada would retaliate against U.S. tariffs if Trump doesn't reverse course. "Canadians are polite, we're reasonable but we also will not be pushed around," Trudeau said. "To our allies: bipartisan majorities of Americans remain pro-free trade, pro-globalization & supportive of alliances based on 70 years of shared values. Americans stand with you, even if our president doesn't," McCain said in the tweet. "International cooperation cannot depend on being angry and on sound bites. Let's be serious," the official, speaking on condition of anonymity, added.